“With that kind of income growth there’s going to be consumption growth, there’s going to be GDP growth, we’ve got all this capital spending—it’s just impossible,” he said. My view (from my experience being on CEA staff in March 2001, when that recession began): beware data revisions. Figure 1 below shows how the data available in April 2001 differed from that reported many years later. Figure 1: Real GDP normalized to 1999Q1 as of 1/31/2001 (blue), as of 4/27/2001 (red), as of 7/27/2001 (green), as of 6/28/2018 (black). NBER defined recession dates shaded gray. Source: ALFRED, BEA, NBER, and author’s calculations. Figure 1 summarizes some key estimates, including that from a recent study by Cruz-Cano and Mead. First, there is some confusion over whether the data differs between BLS, or BLS via FRED. Figure 1: Nonfarm payroll employment (dark blue), and stochastic trend (red). Stochastic trend estimated using 2010-2016 data, and regression of first log difference on a constant. Source: BLS March 2019 employment situation release, and author’s calculations. I Spent a Couple Trillion Dollars, and All I Got Was Trend Employment Growth! We are doing as well as we were from 2010-2016, even after massive tax cuts and the end of spending restraints amounting in the trillions. But kudos to JBH for livin’ in a fantasy world … it for sure is more pleasant than my world. Thanks, Drumpf! Notice that as we get closer to May, the futures price converges to the spot. It’s looking a lot like markets do not expect the deal to effectively resurrect the fortunes of the US soybean market. To figure this out, consider the relationship between the log price of gold and the real 3 month Treasury yield, estimated over the 1968M03-2019M02 period. Figure 1: US-Mexico goods trade balance, in billions $, SAAR (blue). NBER defined recession dates shaded gray; Trump administration shaded orange. Source: BEA/Census and author’s calculations. Figure 1: Current account (NIPA definition) (blue), and Net International Investment Position (green), both as a share of GDP. Orange shading denotes Trump administration. Source: BEA, 2018Q4 final release, 2018Q4 international investment release, author’s calculations. There’s been some volatility in trade flows in recent quarters; it’s likely that that is partly due to the timing shifts aimed at avoiding Chinese tariffs. Note the spike in net exports in 2018Q2. Figure 1: UK Gross Fixed Capital Formation, in billions of 2000 pounds, seasonally adjusted (blue, log scale). Post-Brexit referendum period shaded orange. 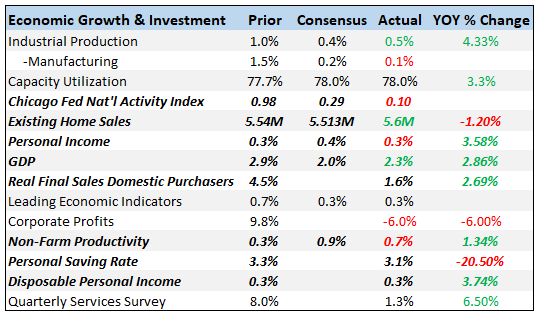 Source: OECD Main Economic Indicators via FRED. So while UK GDP keeps on rising, forward looking components like fixed investment — susceptible to expectations and uncertainty — have already turned down.